Posted by Trixie. October 7th 2014. A cat with a mysterious past and exceptional beauty, the present-day Birman Cat is a fascinating blend of east and west. According to legend, the sacred Birman cat attained its unusual light gold colour when a priest died in an ancient temple in the presence of his accompanying cat. On the death of his companion, the cat looked into the blue eyes of a goddess in the temple which is how it got its eye colour. Seven days later, it also died and took the priests’ spirit with it. A distinct feature is the white on its paws. How it came to the western world is obscure. Some say a pair was sent to two men living in France who had helped defend a temple in the cat’s home country. Others say that they were imported to France for breeding. Whatever the story, Birman cats very nearly died out in the west. After World War II there were only two known to be in existence in France. Thankfully, a breeding programme ensured the survival of the breed and the in the mid-60s, it was officially recognised on both sides of the Atlantic. Nowadays, it is an accepted convection for breeders in France, the UK, the US, Canada, Australia and New Zealand to give Birman kittens names which start with a specific letter depending on the year of birth. The Birman cat has a medium-length coat. It is a pointed cat with blue, red, cream, lilac and brown tip varieties and white paws. The eyes are blue and whilst males weigh 8-12 pounds, queens (females) are a little bit smaller. 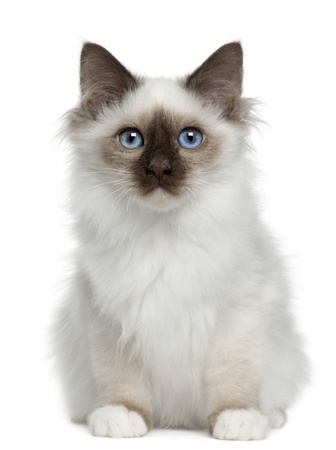 The Birman cat has a balanced personality and mixes well with people. It’s the type of cat which will come and greet its owner when they arrive home – and not just because it wants feeding either. It loves company. The Birman breed can suffer from feline hypertrophic cardiomyopathy (HCM), which is the most common heart condition that appears in cats. Experts say it is an inherited condition and it can lead to heart failure and back leg paralysis. This is not overly prevalent, however. Other than this, Birmans’ do not have any special health problems and, with regular check-ups at the vet they should live healthy lives. They also don’t need much training: kittens tend to teach themselves how to use a litter box if one is placed in front of them frequently enough and this makes house training simple. It’s easy to take care of a Birman cat’s coat. The fur texture doesn’t matt and, because it is a single layer, it only needs occasional combing which makes it easy to maintain. As with all cats, you should keep an eye on claws to ensure they don’t get too long or dangerous and also pay close attention to their teeth, mouth and whiskers. 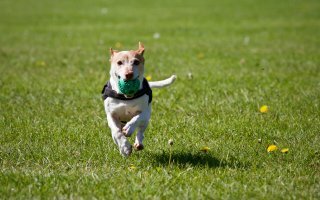 If you’re nervous about inspecting or managing these areas yourself then your vet may be able to perform small grooming tasks for you.